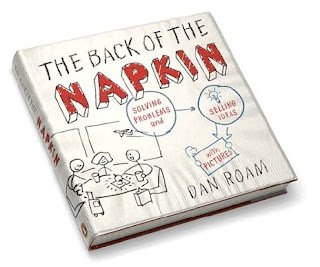 The Back of the Napkin is a book about 'solving problems and selling ideas with pictures'. It is an extremely interesting book. The essence of the book is: "We can use simple pictures to help us solve any problem or to communicate any idea effectively." Overall, this book is about visual thinking. How to think about an idea visually so that we see it more clearly and hence discover new solutions. The entire premise is that when we look at an idea or a problem 'visually' we 'see' it better. This book is for everyone. Managers will find this book especially helpful because they need to constantly 'solve' problems and 'present' their ideas to management. We will not be making any complicated images, so you don't need to be good at making pictures in order to implement the techniques taught in this book. We will just draw simple images. The images we will draw will have circles, square & rectangular boxes, arrows, etc. The process of visual thinking shared in the book is Look-See-Imagine-Show. Looking is the process of collecting all visual inputs (everything that's around you) about the problem at hand. Seeing is to focus on what's important (relevant). Imagine is to see what's not there (discover something new). To show is to finally present it to others so that they can see what you see clearly. Example: You are making a presentation. When you look, you collect everything that you can talk about. Everything. When you see, you focus on what's relevant and important. Then you figure out what is the best way to convey our message (imagine). Finally you draw the pictures and show to your audience. How to look at a problem from all angles? 2. How much? / How many? Asking these questions will help us 'see' the problem better. Once we have done that, we come across another framework which will help us dig deep into the problem. The framework is called SQVID. I would not like to delve into it here. It is better if you read the book. The beauty of the book lies in making you realise the power of pictures. The book is a quick read and written in simple English but the concepts will take time to sink in. At first even I got confused as to how do I apply the frameworks taught by Dan to every problem at hand. I have made some progress, but I have to agree that it takes time. I am still trying to apply what I have read. How to use the book? Read the book and understand the process of visual thinking. Use it as a guide book. Refer to it when faced with a problem. You will find a new power in your hands if you try to use a picture to solve every problem or share every message. See a presentation which applies back of napkin framework to explain an issue.